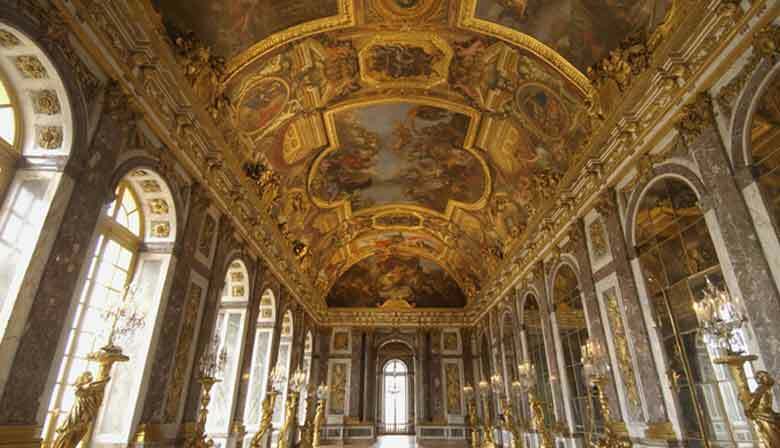 Stretching for more than 721,000 square feet, the Palace of Versailles consists of over 700 rooms. Your audio guide will help you find your way during your visit, tell you about the history of the palace, and immerse you in its special atmosphere. Visit the palace's most beautiful rooms: the King's Grand Apartment, with seven salons each dedicated to a different god (Apollo, Mars, Mercy, Venus, etc. ), and the Queen's Grand Apartment, laid out in a mirror image of those of the king, including the Coronation Room and the Queen's Bedroom, once occupied by Queen Marie Antoinette. Spend time marveling at the spectacular Hall of Mirrors, a unique room in which guests were received and impressed, designed by the famous architect Jules Hardouin-Mansart. Almost 240 feet-long, it was designed to astonish the Sun King's (Louis XIV) visitors and is lit by 17 windows and 350 mirrors. It also offers breathtaking views of the palace's beautiful gardens. Get an exceptional view of Paris from the open-top bus. Make the most of the 4 routes and 38 stops. You can hop on and off at any time to visit the capital at your own pace. The audio guide is available in several languages to help you learn more about the history of Paris and its monuments. With commentary available in: French, English, German, Spanish, Italian, Portuguese, Russian, Japanese and Mandarin. Commentary is also available in 3 languages for children: Paris tales and legends (including the Phantom of the Opera, Quasimodo, D'Artignan, and more!) are read in French, English and Spanish. The Open Tour Paris pass is valid for one day, no matter the time you start the tour. Important: Closing of the Queen’s State Apartment for renovation works. From April 1st, the Queen apartments will reopen, you will be able to visit them again. Enjoy fantastic views of Paris from the open top deck, it's unique, it's L'Open Tour ! It was fall and the weather was less than great so the 1/2 day tour of the Palace was perfect and the tech used on the audio portion worked very well. My fiancé and I bought a half day one & it's only 2 hours, so If you want to see the gardens.. go with full day! But the palace is amazing ! !